Many insects and crustaceans have the ability to inflicts stings when threatened, while others use stinging as a method of paralyzing their prey before eating them. This page deals specifically with bees and wasps, both of whom belong to the family Vespidae and use their stingers primarily for self-defense. Honey bees are essential pollinators and should not be interfered with except when they build nests inside structures or otherwise pose a threat to human health and safety. They usually are non-aggressive unless they are threatened. Honey bees populations have been under pressure from presently unclear causes for the past decade or so, and their numbers are in decline. Because they are essential to pollination and agriculture, it is more important than ever that honey bees be protected. They do become problematic, however, when they build nests in homes and other human-occupied buildings, usually in wall or ceiling voids. When control is necessary, the preferred method of removing honeybees is to have a beekeeper remove and relocate them. 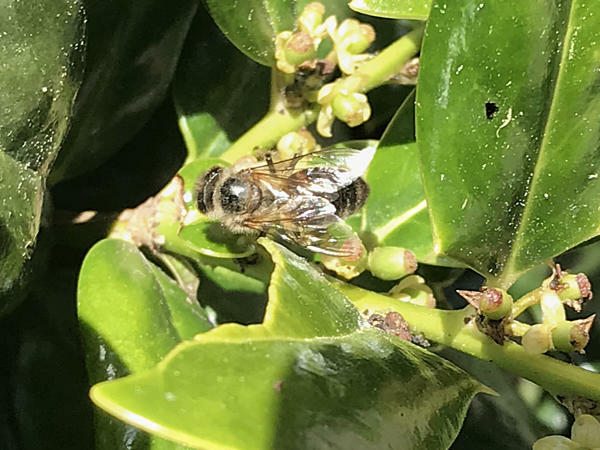 Honey bees should only be killed when they are presenting an imminent threat to human health and safety or when their non-lethal relocation is impractical. Because of the risks of stings, bee control is best performed by professionals. When it's necessary to chemically treat a honey bee nest inside a structural, the best method is to locate the nest as precisely as possible using a FLIR camera or a stethoscope, drill a hole into the nest, and treat the nest using a bulb duster and a dust insecticide labeled for bees such as Drione Dust or Delta Dust. The operator must wear a bee suit to protect against the near-certain bee attack once the insecticide is applied. Once the nest is dead, it will have to be removed. Usually this means cutting the wallboard or other wall or ceiling covering. The nest has to be removed because without the bees to "air-condition" it by flapping their wings, the wax and honey will melt. This would likely cause damage to the wood and attract other insects and nuisance animals to the nest. Yellow Jackets are wasps, not bees. There are several species, most of which average between 1/2 inch and 3/4 inch (about 13 mm to 19 mm) in length. They are predominantly yellow in color, and most species are agressive when threatened or when their nests are approached. 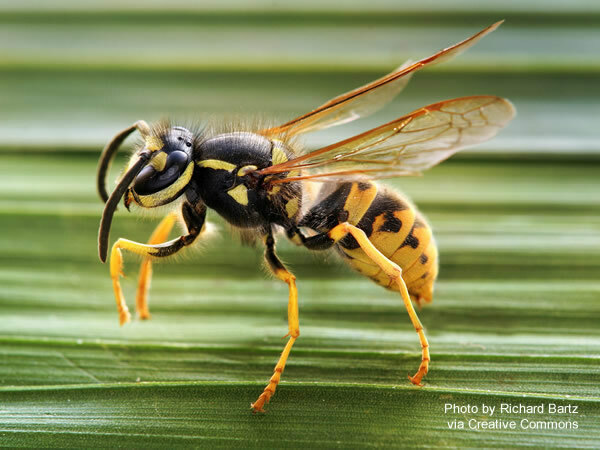 Yellow jackets are very susceptible to insecticides and may be controlled using any of a wide variety of aerosols and dust products that are labeled for their control. But because yellow jacket nests are often concealed within structural voids and may have multiple entry holes, control can be difficult. As with honey bees, the best way to treat a yellow jacket nest in a wall or ceiling void is to precisely locate it and introduce a dust insecticide like Drione Dust or Delta Dust directly into the nest using a bulb duster. It is not necessary, however, to remove the nest because yellow jackets don't produce honey or wax. Because of their aggressiveness and the difficulty of locating their nests with precision, I recommend that you hire a professional to deal with yellow jackets inside walls or voids be left to professionals. If you do decide to do it yourself, always wear a bee suit to protect yourself against the almost-inevitable attack. If your yellow jacket problem is limited to visiting wasps coming around looking for food (for example, around an outdoor picnic table), there are many good yellow jacket traps that can dramatically reduce the number and annoyance of wasps, without the risk of being attacked or of pesticides poisoning beneficial insects. 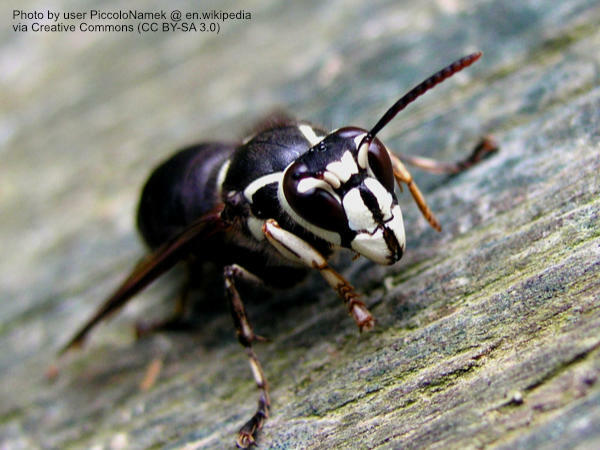 Baldfaced hornets are about an inch in length, black in overall color, with white or yellow markings. They build exposed nests in trees or bushes or suspended from horizontal surfaces. Hornets are extremely aggressive and have been known to attack in great numbers with little or no provocation. When this happens, the multiple stings can be life-threatening. Because of their extreme aggressiveness and the risk involved in treating them, I strongly recommend that you call a professional to treat a baldfaced hornet problem. That being said, if you do want to treat them yourself, you can use the same dust products recommended for bees and wasps (Drione Dust or Delta Dust), applied directly into the nest hole while wearing a protective bee suit with some additional heavy clothing underneath. Hornets can sting through most bee suits. Because hornets usually build their nests higher up in the air than most other insects, you'll also need either a ladder or an extension duster like the Dustick to apply the insecticide. You can also try an aerosol hornet and wasp freeze spray, but be aware that you get exactly one chance when using these products. 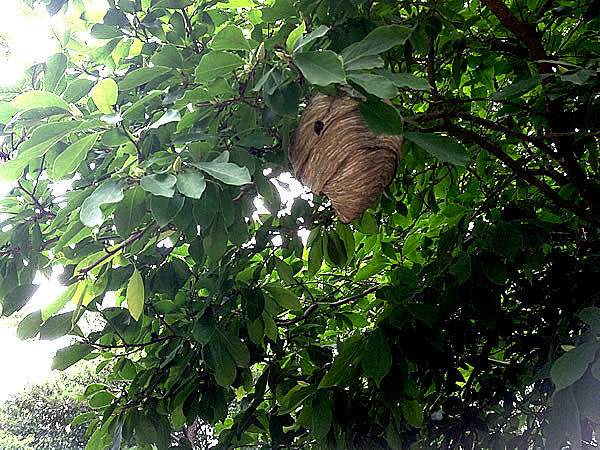 If you miss the hole in the nest, the outcome is likely to be a whole colony of very angry hornets looking for the person who tried to poison their world. Always wear a bee suit with some extra clothing underneath to guard against that possibility. Also be aware that some wasp-freeze sprays can damage the paint on houses or cars, and some are toxic to plants. So as with all pesticides, carefully read and follow the label before using a wasp-freeze spray. There are many species of "paper wasps" whose size, appearance, and habits vary greatly. All species build their nests out of paper that they manufacturer themselves from wood and saliva. Most species are relatively non-aggressive unless directly threatened. 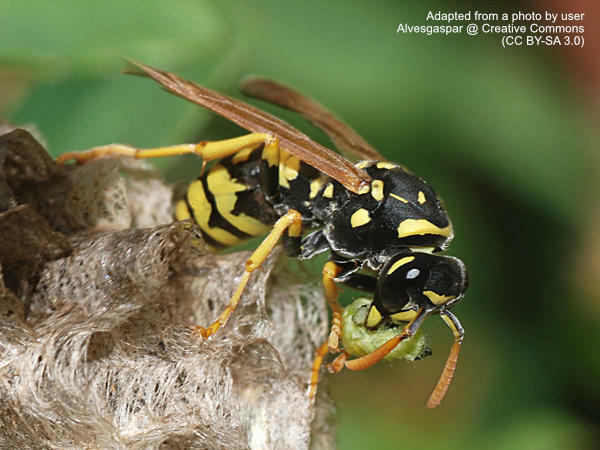 Typically, paper wasps build their nests in relatively exposed locations under horizontal surfaces, such as under porch ceilings, attached under the top of door and window trim, under awnings, etc. They also build nests in hollow voids such as metal fence posts and swing sets, basketball hoop stanchions, PVC furniture, and inside vacant bird houses. Paper wasps in places like fence posts and PVC furniture require a bit more finesse and a bit more risk, since you have to get closer to the nest. Most professional exterminators use dusts like Drione Dust or Delta Dust injected into the posts or furniture to treat these sorts of problems, and most professional exterminators get stung in the process from time to time.